China calls President Donald Trump’s threat to slap more tariffs on Chinese exports to the U.S. “extreme pressure and blackmail” and threatens to retaliate. 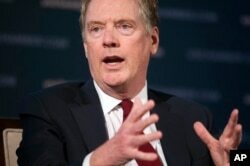 U.S. Trade Representative Robert Lighthizer speaks at the 9th China Business Conference at the U.S. Chamber of Commerce in Washington, May 1, 2018. 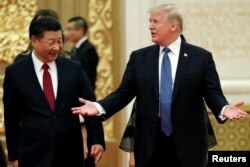 The president has ordered Trade Representative Robert Lighthizer to identify a list of $200 billion in additional Chinese goods subject to a 10 percent tariff — a move that would bring on another round of Chinese penalties on American products. Trump has already ordered 25 percent tariffs on $50 billion in Chinese products. Those penalties are scheduled to take effect next month and will likely be followed by Chinese countermeasures. National Trade Council adviser Peter Navarro waits on President Donald Trump in the Oval Office at the White House, March 31, 2017, in Washington. Trump and Chinese President Xi Jinping held a summit last year at Trump’s Mar-a-Lago resort. But that meeting and several rounds of trade talks between high-level officials in the past year have not yielded any progress. “It is important to note here that the actions President Trump has taken are purely defensive in nature. They are designed to defend the crown jewels of American technology from China’s aggressive behavior,” Navarro contended. U.S. stock market tumbled on Tuesday following the latest salvos between Washington and Beijing. The Dow Jones Industrial Average lost more than 1.1 percent at the close of trading and other major indexes posted losses as well. 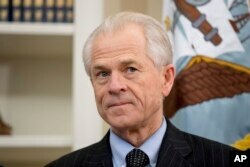 But Navarro dismissed concerns about how the administration’s trade policy would affect the financial markets and global economy, saying it will have only a “relatively small effect.” He argued the U.S. steps will ultimately benefit the country and global trading system. U.S. President Donald Trump and China's President Xi Jinping arrive for a state dinner at the Great Hall of the People in Beijing, Nov. 9, 2017. He has imposed tariffs on aluminum and steel imports from Canada, Mexico, and the European Union and is feuding over trade with some of the United States’ closest allies.